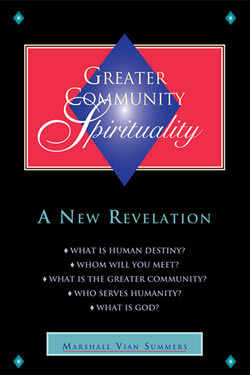 Home » The Message » Volume 2 » Greater Community Spirituality » What is Life Force? We introduce the term Life Force here. However, before we speak about it, we would like to bring it into a greater context, a Greater Community context. These words are familiar to some people, and there is a great deal of idealism and speculation about what Life Force really is and what it can do. But again, when we use familiar words or terminology, we must bring them into a greater context. If you can enter into this greater context, then everything that we are saying will be illuminating and very useful and valuable. If you cannot enter into this greater perception and perspective, then you will continue to interpret things according to your own interests, ideas and understanding. Life Force is an energy which exists in all living things. This is a familiar idea to many who read these words. However, in the Greater Community, Life Force has a greater value. It is an actual power that is cultivated, used and developed by certain races for certain purposes. Because there are adept individuals in all societies throughout the Greater Community, there are always demonstrations of greater skill, greater awareness and greater ability. However, if these are discovered by the powers that rule these societies, then these powers and abilities are put to work either as a defense or as a tool for controlling others. The discovery of greater powers, abilities and awareness becomes a liability for any society once these powers have a popular application and are seen as useful in dominating or controlling others. That is why the Wise remain hidden: to remain alive and to maintain those greater powers and abilities that they have discovered. These powers and abilities have a real usefulness in the hands of the Wise, yet once these powers become used for political or military purposes, then their usefulness declines, and they can become weapons that are used against others. This is demonstrated in many places in the Greater Community. Finer and more subtle abilities exist within all individuals, and greater powers exist within particular individuals and within particular cultures or races. These can all be exploited for political or military value. Therefore, there is a great burden in carrying Knowledge and Wisdom: the burden of keeping them hidden, knowing who to share them with and how much to share. This is why popular teachings about Life Force are fundamentally in error. Even the good intention to share something of value with others is often born of ignorance. Power must be accompanied by Wisdom and restraint if it is to be useful and effective. All that we speak of in the Books of Knowledge represent a mystery and a great opportunity for you, but they are not easily accessible. You must study and prepare, and you must pass certain tests in life. You must demonstrate your sincerity, your humility and your self-honesty in order to advance and to gain access to the greater powers that we speak of, which are meant for you. Life Force is a power. It is within you, but you cannot gain control of it. It is possible to use it in certain situations, but to actually have authority over it requires a highly developed and adept mind. This is important because in physical life you have the potential for power, ability and awareness. If these are cultivated wisely and applied appropriately, they become beneficial for you and for others. However, if they are used for other purposes—if they are used for defense or if they are used for conquest, manipulation or control—then in essence they become evil, something that is inherently destructive and counterproductive to the greater purpose of life, which is bringing all beings towards union and realization. Life Force is important because it represents part of your experience of being in the world. It is a power that runs through your body. It is neutral. It is neither inherently good nor bad. The question then is, how will you use it? For what purpose will you use it? Will you invent your own purpose and apply it there? Will you justify your attempt to harness it based upon your own high ideals, your great thoughts or your altruistic ambitions? If so, it will elude you and deceive you. It will corrupt you and work against you. We speak of Life Force here because it represents power in the world. And what we have to say about the discovery and cultivation of this power applies to all forms of power in the world. Life Force can be harnessed and directed. It is neutral, so it does not have a will. If it is cultivated according to the guidance of Knowledge, the greater Knowing Mind within you, then like all forms of power, all abilities, and all forms of awareness, it will find a good purpose here. Here you must stop and ask yourself these questions: “Why do I wish to know about this? What does it mean for me? What are my ambitions regarding it? Am I willing to train and prepare slowly and gradually in order to find these greater abilities that are being spoken of here?” Ask yourself these questions, but do not give a ready answer. Instead, abide with these questions so that a deeper understanding may emerge within you over time. All that is great in life will elude you if you seek it for selfish purposes. All that is genuine and meaningful will turn sour if it is sought to fulfill your ambitions or personal goals. Thus, the Wise remain hidden to nurture their development, to give their gifts appropriately and to protect themselves from the usury of the world. The more you know, the more discreet you must be. The more you have, the more discerning you must be. The greater your capability, the more restraint you must exercise. This requires great self-purification. In the Greater Community, Life Force has been harnessed successfully by individuals and small groups of individuals who serve a greater network of the Wise. This network is called the Harim. This word, which is from the Septoral language, speaks of those who uphold Knowledge in all worlds. Their purpose is not local or ambitious. They represent a universal purpose that bonds them with others very different from themselves. This has created an association of the Wise who are unlikely ever to encounter each other face to face in manifest life. It extends the whole network and fabric of genuine relationship beyond the visual realm. Here heaven and earth overlap. Within these overlapping boundaries, there exists a greater bond of relationship, a greater awareness and a greater experience of life. Knowledge within you will guide you to utilize all aspects of yourself appropriately and harmoniously and will lead you to develop certain aspects of yourself for certain specific purposes. It will not guide you to cultivate all aspects of yourself because this is unrealistic. It will not ask you to develop all of your capabilities to a high-functioning level because this is not possible. However, it will direct you to develop certain inherent abilities and certain skills that are relevant to your specific purpose in the world at this time. This is why there can be no ambition on your part if you seek to gain access to Greater Community Knowledge and Wisdom. Even if your motives are pure, should others discover your growing abilities, they will attempt to use you for their own purposes. Some will idolize you; some will try to follow you; some will glorify you; and still others will try to steal from you. Some will try to destroy you. Many will malign you. This truth comes as a great shock to the developing student of Knowledge who discovers early on that their quest for Knowledge is not shared by others, even those whom they love and value. Later they discover that their development alters people’s perceptions of them, and people begin to act in very strange ways around them. Eventually, they will see that their gift, which is now slowly emerging within their own awareness, must be protected and safeguarded and given with great specificity to certain individuals at certain times. This requires tremendous restraint, for each person is eager for power and control to offset his or her sense of insecurity in physical life. Ambition exists within each person. Within the student of Knowledge, it must be discovered and arrested in all of its manifestations. It is not power that you must focus on; it is your approach to power. It is not your abilities that you must claim; it is your understanding of them that must be cultivated. Once this has been accomplished, and this indeed may take a great deal of time, then things can be given to you. Then they will bear fruit within you, and they will find their rightful recipients within the sphere of your relationships. You will give to some and not to others. You will speak to this person but not to that person. You will give your gift here but withhold it elsewhere. This understanding is not comprehensible to the casual observer or even the critical observer, for they see things only according to a set of assumptions which they themselves have not challenged or faced. Life Force within you can exert an actual physical effect. It can have an impact in the physical environment. In the mental environment, it can take the form of thoughts, forces of energy, powerful and self-sustaining ideas, and so forth. It is a power. Life Force is not the same as Knowledge because Life Force is not intelligent. It is like clay—you shape it, you form it and you use it for specific purposes. It is subtle, so most people are unaware of it. It is pervasive, so it is very effective. It is everywhere, so it can be harnessed and used. It abides in all living beings, so its application is universal. Should you be directed to develop Life Force within yourself, you will have to learn great restraint. It will turn against you if you use it for selfish purposes to fulfill your goals or ambitions. Here it will turn against you even if you want to use it to help humanity. Unless Knowledge is your guide, your counsel and your restraint, you will create discord, confusion, despair and failure. You cannot use the power of the universe for personal reasons and hope to achieve anything of real merit or value. This is a truth that is universal. It affects all intelligent beings everywhere. With power and control come great responsibility and the need for restraint. When these are lacking, power is destructive. When these are present, power carries on a greater and more beneficial effort that can have great and lasting impact wherever it is applied. Should you become a real student of Knowledge, you will begin to feel things consistently that you only rarely felt before. You will be able to experience life on a more subtle level as you prepare in Steps to Knowledge. Here you will need true instruction because you will need to identify and clarify your ambitions, both those that are known to you and those that will emerge within you as you develop. Here temptation can be very great. Here you cannot teach yourself. Here you must give yourself to your instructor and trust your instructor to guide you and to prepare you, to hold you back and to send you forward. In the Greater Community, Life Force is a power that is used. It can have great influence over the unknowing. Its equivalent in the mental environment is the power of projected forms of thought. In the physical environment, Life Force exerts an actual force that moves things and creates an impact and a reaction. Someone can knock you down with Life Force even if they are standing across the room. Someone can weaken you physically using Life Force even if they are across the street. Life Force is not as effective in the physical environment as it is in the mental environment, where thoughts can be directed at an individual thousands, even millions, of miles away and have an impact. This is true because in the mental environment there is no resistance except the resistance of countering ideas. In the physical environment, there is a great deal of resistance, such as the resistance encountered by a moving object. In the mental environment, there is nothing that affects the velocity of a moving thought except a countering thought. And a countering thought must be born of a mind that is aware of what is impacting it and can arouse within itself power in the mental environment to counter, obstruct or prevent the accelerating thought from reaching it. We call this mental screening. It is a great ability. You cannot use this ability constructively unless you are selected by the Wise and prepare for a very long time. You must begin to learn about Life Force now because it represents part of what affects you individually and what shapes your world. As Greater Community influences gain a greater stronghold in your world, their abilities, their power and their awareness will exert an ever greater impact on all aspects of your life. Some of these are very manifest, but many are quite subtle. Often they cannot be seen. However, they can be discerned because you can feel them. Why is this important in the context of spirituality? Because it represents the world into which the Creator has sent you. Given a real understanding of your purpose and a real experience of its meaning, you will see that everything fits within this theological context because of the nature of your origin and your destiny—where you have come from and where you are going. The world is a place that you are in temporarily. Therefore, where you have come from and where you are going provide the real meaning of your existence here. Life Force is power that few have ever discovered and fewer still have ever learned to use constructively. There are those in the Greater Community who can use it in certain situations, but this does not mean that they can control it. There is a very great difference between use and control. For example, you use electricity, but the ability to control it, redirect it and guide it represents a greater set of skills and abilities. You use the power of the sun to grow food, but can you harness the power of the sun? Can you control it? Let us give you this understanding: No one in physical life can control the mechanism of the universe. No one in physical life can control time. They can use time, but they cannot fully control it. The Wise know the limits of control and exercise their abilities appropriately. The foolish think that there are no limits, that everything is there for them to acquire, to conquer or to obtain. No one individual or group of individuals can gain control of the physical universe because everyone exists within limits. It may appear that you have great power and ability compared to other people. However, seen in a larger context, you have significant limits. Knowing your limits represents an aspect of Wisdom. Knowing what you can develop and what is beyond your reach represents an aspect of Wisdom. These are learned as you proceed in The Way of Knowledge because here you are beginning to distinguish greater powers from lesser powers. You cannot control Knowledge, the Knowing Mind within you. You cannot direct it to give you what you want. You cannot focus it to produce the results you want. You cannot use it to influence others. Why? Because it is more powerful than you are. You can enter into relationship with it; you can reclaim it in your awareness; you can learn to reassociate with it by taking the steps to Knowledge, but you cannot control it. You can only control your expression of it, and this is within your range of responsibility. However, do not think for a moment that this is a small responsibility. It is actually very great and represents consummate learning in the human environment. It is an interesting fact of life in the Greater Community that the Wise are all very similar, and the unwise are all very different from each other. The Wise from your world and the Wise from other worlds have so much in common. However, the unwise are so distinct. The Wise in all worlds have a means of communicating with each other through Knowledge, yet the unwise cannot recognize or communicate with each other. The Wise see what is the same; the unwise see what is different. The Wise identify with what is the same; the unwise identify with what is different. In order for humanity to have any advantage in the Greater Community, certain individuals here must become wise within a larger context in life. And others must support these individuals because for every individual that advances, it takes a great deal of support from others. This is how Knowledge is kept alive in the world. And this provides a means for Knowledge to be communicated in the world through a network of relationships all supporting a central focus. This is how greater things are communicated throughout the Greater Community, throughout all manifest life and indeed even beyond manifest life. Real Wisdom is passed on through a network of relationships. Like water seeping downward through the soil, Wisdom finds its real channels and its path of least resistance. It creates pathways where Knowledge can be passed on, transmitted and initiated from person to person through a means that is both wonderful and mysterious. The pursuit of Knowledge and Wisdom is not an individual quest; it is a collective effort. For anyone to advance requires meaningful involvement with many other people. Developing this understanding indeed is part of the education of going from a singular approach to a community approach, going from a singular viewpoint of life to a Greater Community understanding of life. This is a part of your education. This is a part of the transition from being lost in your individuality to being embodied in the Greater reality. Life Force means something different at either end of the spectrum, and your understanding of it will change as you pass through the spectrum on the way to a Greater reality. Indeed, all that we are presenting in Greater Community Spirituality is important because it takes you to a Greater reality. It cannot be used within an individual reality. The Greater Community Way of Knowledge invites you to find escape from your own isolation, escape from being lost in your own individuality and escape from being a prisoner of your own mind. It invites you to rediscover your intrinsic relationship with all life and the specific purpose which is yours to reclaim and to contribute in this life, at this time, in this world. You will need Life Force to progress, to advance and to carry on your preparation and your contribution. The extent to which you will need to use it and how you will need to use it depends on the role that you are here to play. Your role here is predetermined, but how it will be carried out and the time it takes to carry it out—especially the time it takes to discover it and to prepare for it—can vary considerably. In this, your decision making has great importance, and indeed you will determine if the outcome can be achieved. What greater responsibility would you ever want to assume for yourself? People who think that they can create their own destiny and who call this their freedom have no idea of the burden that they are placing upon their own shoulders. This burden is great because it guarantees failure. You cannot control your greater destiny, but you can experience it, and you can find a way to express it. In this, you will have to make many decisions; in this you will have to assume greater responsibilities; in this, you will find your power; and in this, you will assume authority in your life. You are the captain of your ship, but it is not up to you to determine where it is sailing and for what purpose. Even what your ship contains is beyond your authority. Consider these words carefully and do not make a mistake here. To become the captain of your ship is a responsibility and a power that few people have ever assumed. To become a true captain means that you are aware of everything concerning the protection, maintenance and well-being of your vessel and that you have respect for its secret cargo and its true destiny. While many people proclaim that they are the captain of their own lives, they have no idea what this means. In the Greater Community, personal freedom has a different context and a different value. Advanced technological societies are highly organized. Individuals are not free to do whatever they please whenever they please without regard for others. The Greater Community is a competitive environment on a scale and a magnitude that you cannot even imagine. Therefore, to become effective and competitive in this environment, and, beyond this, to gain Greater Community Knowledge and Wisdom, you must over time reassess all of your values and assumptions. Personal freedom is chaos without Knowledge. It is the source of everyone’s mental and physical illness. Contrast will show you this as you learn to associate with those who are beginning to discover a greater purpose and meaning in life and as you yourself begin your own discovery of this. The contrast will be marked. You will see yourself going in a different direction from everyone else. You will see yourself valuing experience more than ideas, insight more than assumptions, patience more than acquisition and affinity more than possessions. You will travel a different path, and the discrepancy between your growing understanding and the assumptions of your nation, of your culture, of your group and even of your family will become greater and greater. Such is the burden and the promise of discovering Knowledge throughout the Greater Community. Life Force is within you. You can feel it at this moment. It is breathing your body; it is moving your blood; it is keeping your nerves alive; it is sparking your mental awareness. It is here right now, and it will grow in scope, meaning and value for you as you progress in The Way of Knowledge. It will grow as you leave your ideas, beliefs and assumptions at the outer gate of the temple and enter in where True Wisdom and Knowledge can be imparted to you.